Eating Keto has been challenging at times but overall has been a life changing experience. However, despite what people say you will still crave EVERYTHING. Pizza, Candy, Soda and yes even cookies make the list of temptations daily. Early on in our diet process we avoided all deserts for fear of giving in, but now that we are farther along we have built up some will power. As we said though the craving is real and Chocolate Chip Cookies were on the mind. We found a recipe online (www.fatforweightloss.com) that looked good and went for it. Preheat your oven to 355 degrees. Microwave the butter for 30 seconds to melt, but it shouldn't be hot. Place the butter into a mixing bowl and beat with the Erythritol. Add the vanilla and egg, mix on low for another 15 seconds. Add almond flour, xanthan gum, baking powder and salt. Mix until well combined. 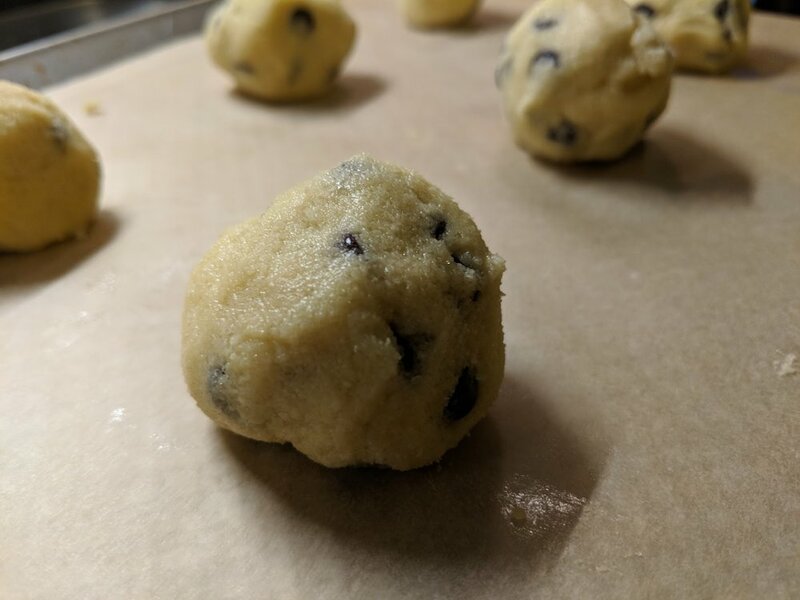 Press the dough together and combine the chocolate chips into the dough with your hands. 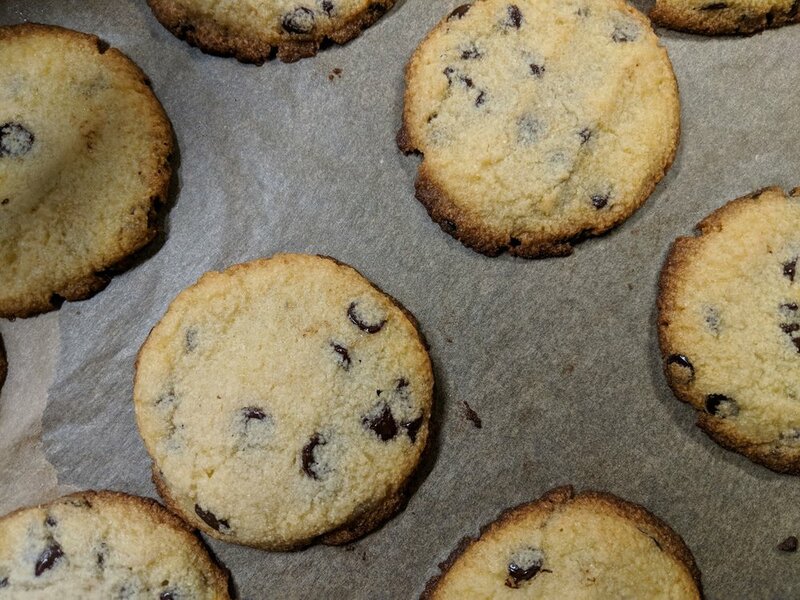 The cookies turned out as close to "regular" Chocolate chip cookies as we could have hoped. Our cookies did not fully flatten in the oven, so we did need to push them down by hand. This most likely happened did not fully melt our butter, as suggested in the blog post at www.fatforwightloss.com. Despite this a little help flattened them. Right out of the oven they were very soft and you could not pick them up, but once they cooled a bit they were both first but soft. The chocolate chips were perfect in this recipe, we highly suggest you use Lily's Sweets Dark Chocolate Chips. They have the perfect taste and consistent to rival regular chips. These cookies turned out better than expected. This recipe is a most definite a Keto Should Eat. These cookies are so good, you will find it hard to have just one, but with just 2.3 Net carbs you can splurge a bit.